Gretsch uncovered a set of Baldwin-era Filter’Tron pickups with incredible punch and twang. They reverse engineered those special pickups to create the set of “Black Top” Filter’Tron humbucking pickups that you’ll find loaded in this G5420LH. With their robust character and trademark cut, the Gretsch Black Top Filter’Tron humbuckers keep you ready for everything from rockabilly and country to blues and classic rock. They’re quickly becoming very popular at Sweetwater. 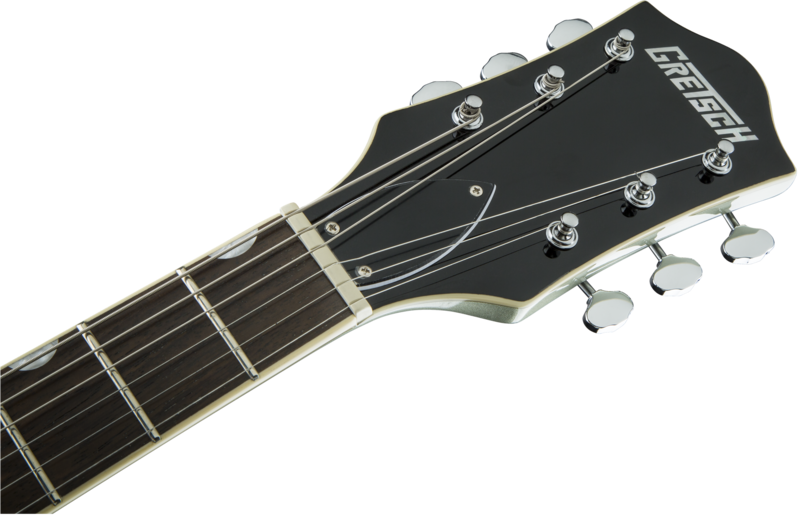 The Gretsch G5420LH Electromatic allows you to pull off a lot of tonal tricks. Volume controls for each pickup help you create a perfect balance between warmth, bite, and brilliance when both pickups are engaged. The master tone control lets you fine-tune your sound once you have the pickups dialed in. And thanks to the master volume control, you can take your tube amp from clean to growling without changing the balance between your pickups. And of course you’ll get sweet tone from the neck and bridge pickups individually. Finding exactly the right guitar can be difficult for left-handed players. But Gretsch’s G5420LH Electromatic hollowbody electric guitar puts the company’s unmistakable tone in a left-handed hollowbody that’s sure to please. With top-end features like the “Black Top” Filter’Tron pickups and expertly applied body, F-hole, and fretboard binding, left-handed players searching for the powerful tones of Brian Setzer, Billy Duffy, and Duane Eddy can rejoice in the quality of their new guitar. Left-handed players will love their Gretsch G5420LH.